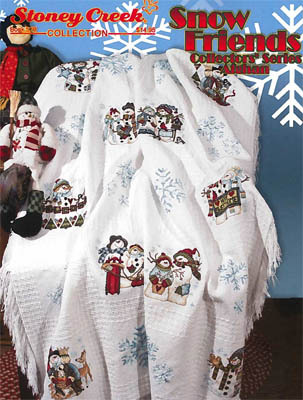 From Stoney Creek and made up of ten snowmen designs stitched on a 14ct Lady Elizabeth afghan consisting of twenty squares (***the Lady E afghan is currently out of stock - SC recommends using a 4 square by 5 square cut of 14ct Novara afghan fabric). The ten remaining blocks are filled with snowflakes to complete this winter wonderland. Each snowman design has an approximate stitch count of 85w x 83h.